The Mathematics Department curriculum explores and allows students to understand, develop and interpret mathematical concepts. The Curriculum is designed around key elements of Number, Algebra, Geometry & Measures and Data Handling. At KAA we believe Assessment is a collaborative and ongoing process. Continuing this process every half term supports students in taking responsibility for their own learning. KAA students have structured half terms consisting of teaching weeks, followed by Consolidation week, Assessment week and Review week. Learning at KAA is always posed as a question or problem to be solved. Mathematics is no exception and the entire curriculum is structured around a series of ‘fertile questions’. These fertile questions each frame a unit of mathematical work, adding meaning and real-life application to ideas which may otherwise appear quite abstract. Students learn and understand how to analysis mathematical problems; interpret and evaluate results. Students build on existing skills to support their learning towards GCSE and A level Mathematics. At KAA we believe every student will be proud to take responsibility for their own leaning and gain the confidence to be real mathematicians and have the hunger to solve real world problems. • Offers support and encouragement to students for whom mathematics sometimes proves challenging. • Encourages students to think and reason confidently, logically and independently. • Fosters good work methods, efficiency, organisation and presentation. •Makes mathematics relevant, but also encourages the enjoyment of it for its own sake. 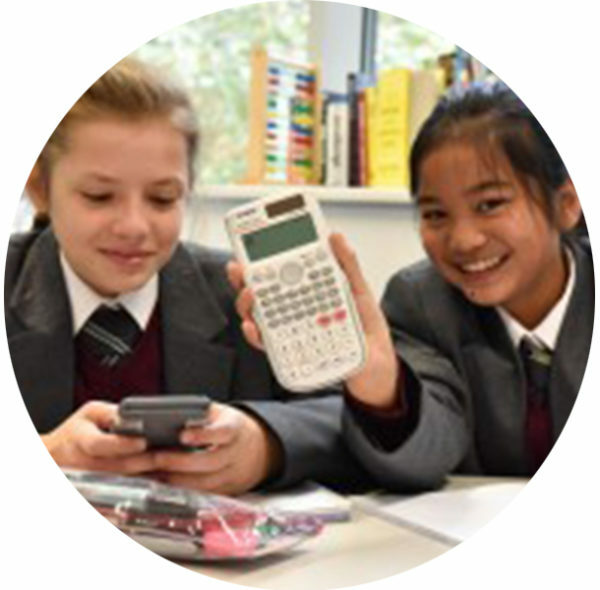 • Enables all students to reach their potential, be it at GCSE or Cambridge entrance levels, through a positive and satisfying mathematical experience. • Develops students’ ability to tackle problems in unfamiliar contexts and to evaluate data in order to make informed decisions. •Makes every student a confident and capable mathematician, for whom mathematical education does not end when their KAA education does. All KAA students will be challenged and stretched preferably by doing more rigorous questions on current topics, rather than covering syllabus content very rapidly. This encourages KAA students to think like mathematicians rather than merely prioritising speed. Half term assessments enable both teachers and students to see how they are progressing. It encourages revision and consolidation and trains students to perform well under exam conditions. Students have two 30 minute homeworks each week. These are set on different (but fixed) days depending on which teaching group a child is in. One of the homeworks will be a more traditional written task, one of the homeworks will be electronic and completed through internet based software such as MyMaths or hegartymaths.com. • The mathematics area at KAA Online should be your first stop for any links to support resources and skills practice for each fertile question / unit taught in maths. • Each student in year 7 will also be given a user name and password for MyMaths at mymaths.co.uk and MathsWatch VLE at www.mathswatchvle.com. This allows them to log onto the site, complete homework, work through topic-specific tutorials and play rich mathematical games. • There are also a whole host of textbooks and mathematics books available for students in the library or the department.